You want a boost gauge to deliver the real-time PSI that your new turbocharged MINI is pumping into your engine. Trick is, unlike many turbo setups, there is no soft line to put a 'T' into to deliver pressure to your gauge. 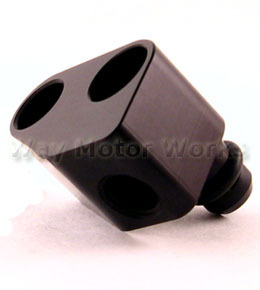 Without a specially made adapter, you would need to drill a tap a hole in the manifold to run a line to your gauge. After easily installing our Psiclone adapter, you can just use the 1/8 NPT thread to quickly attach your line with just the pieces supplied with almost any boost gauge. The Psiclone fits in place between the manifold and the MAP sensor. You will pull out the sensor, plug the Psiclone in it's place, and then, plug the sensor into the Psiclone. That's it. This part fits with the R55, R56, and R57 turbocharged engine setups only.